Welcome to Morrow Sales and Service, serving the Grey/Bruce area for over 25 years. 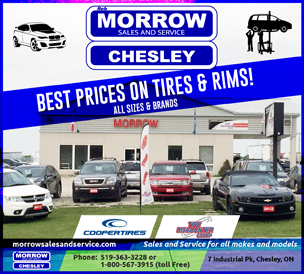 Morrow Sales and Service is located beautiful Chesley, Ontario to serve the entire region including Hanover, Owen Sound, Port Elgin, Walkerton, Wiarton all the way up to Tobermorey. Our staff of trained professionals make the difference. Quality people dedicated to making your visit to Morrow Sales and Service a pleasant one. For sales, service, body shop, tires, parts and auto detailing make Morrow Sales and Service your one stop dealership. Morrow Sales and Service has been serving the towns of Grey and Bruce Counties, including Chatsworth, Chesley, Hanover, Mildmay, Owen Sound, Tobermory, Walkerton, Wiarton and many others.